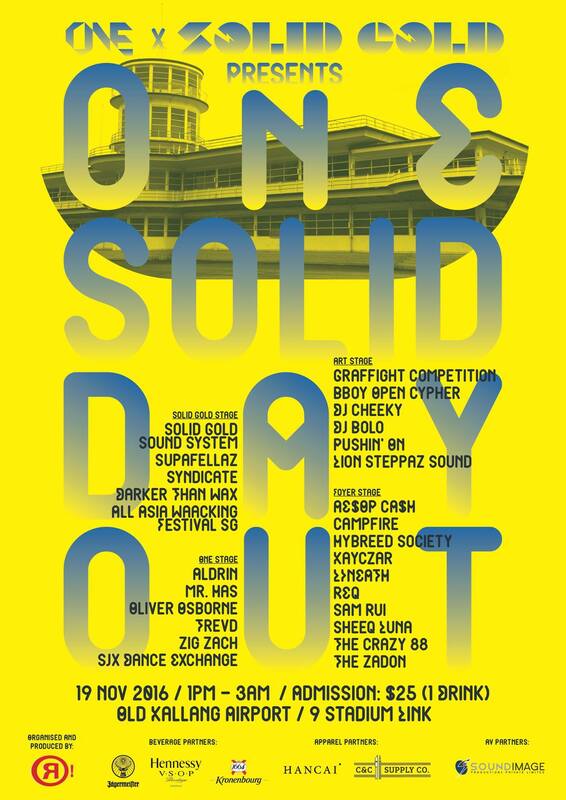 Produced and organized by Recognize Studios in conjunction with Together with One with Music and Solid Gold - brand new urban arts festival One Solid Day Out aims to bring together the best in the local urban arts scene. From DJs and live musical performances to graffiti demos to and dance competitions, this ambitious gathering promises to be one of the freshest features on Singapore's end-of-year event calendar. Held at the iconic Old Kallang Airport (which recently played host to SIFA's Club Malam), One Solid Day Out is certainly bolstered by one hell of a lineup across four stages. For the whole day, the decks will be helmed by notable crews such as Syndicate (with Kiat, Intriguant & Vandetta), Solid Gold Sound System (Koflow, Mr Boo & Try2Play), Darker Than Wax (with Funk Bast*rd & William J), Supafellaz (with Ollie' Des & Rattle), Pushin'On (with Dave Code & Chunk) and Lion Steppaz Sound (with Yooh the Vibration, Selecta Ken, & Shingo). So as you already tell, there'll be plenty of quality funk, hip-hop, bass, reggae, left-field electronica and soul on offer that day. But in the interest of diversity the festival has also recruited renowned ronins such as Aldrin, Mr. Has, Oliver Osborne and Zig Zach to represent the house, techno and disco end of the spectrum, alongside noted party-starters such as DJ Bolo and DJ Cheeky and TrevD. Furthermore, One Solid Day Out's performances will also be headlined by big names such Laneway-bound alt-R&B crooner Sam Rui and standout Grizzle Grind Crew rapper and producer LINEATH. Other live highlights include AE$OP CA$H, Campfire, Hybreed Society, Kayczar, REQ, Sheeq Luna, The Crazy 88 and The Zadon! Pre-sale tickets are on sale right now via Eventbrite at $25 (inclusive of one drink) while at-the-door tickets will be going for a cool $35.